Another poor performance without a goal in a 1-0 defeat at Newport means City’s start to life after Jayden Stockley has not yet gone according to plan, and Matt Taylor’s side will hope the visit of a side struggling at the foot of the table will provide a tonic. 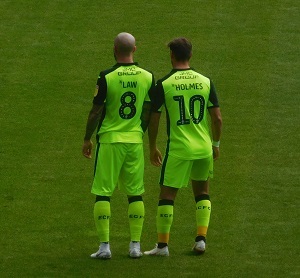 Re-signing Kane Wilson started at Newport in an unfamiliar midfield role while Randell Williams made his debut from the bench, both will be hoping for a start against Cambridge, with Lee Holmes also pressing. A couple of seasons ago Cambridge went on something of a spending spree, forcing their chairman to state this was not a result of spending the money from their FA Cup exploits the previous season. However, things don’t appear to have gone according to plan and the Us come into Saturday’s trip to Devon hovering just above the drop zone albeit enjoying a new lease of life under new manager Colin Calderwood, with three straight wins following a 6-0 hammering by Paul Tisdale’s MK Dons on New Years Day. They twice came from behind against Northampton last Saturday before a last gasp winner. Jeavani Brown is the club’s top league scorer and has seven in all competitions, although the creative spark is likely to come from George Maris. Experienced keeper David Forde missed last week’s win, meaning Dimitar Mitov was in goal.